← Smile! A Traditional Jack O’Lantern Wishes You a Happy Halloween! In 1952, like today, America went to the polls. By the time the votes counted, Dwight D. Eisenhower was the clear winner. The popular World War II hero and five star general was approached by both parties as a possible candidate but ultimately chose to lead the Republican ticket that year. 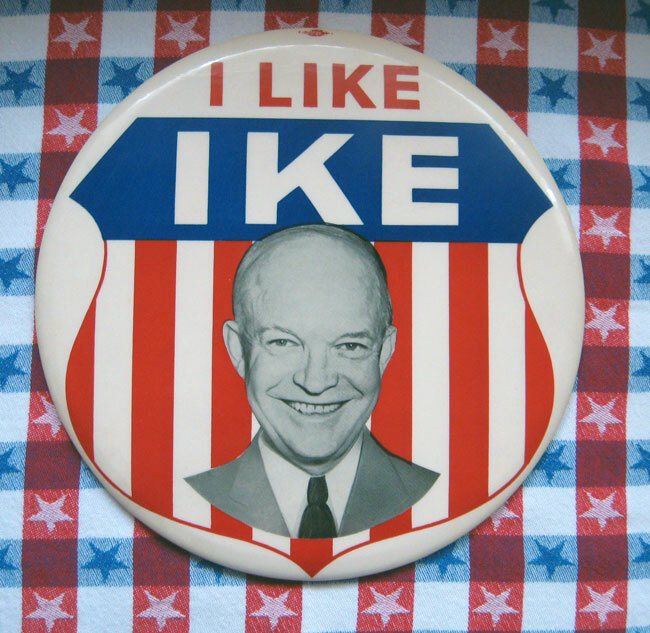 The campaign slogan “I Like Ike” became one of the most famous in history and would be used by Ike again in his successful bid for re-election in 1956. This “I Like Ike” button is a whopping nine inches in diameter! Somebody obviously really liked Ike back then. This entry was posted in 1950's, Americana, Historical, Jim, Political. Bookmark the permalink.